I keep hoping the monks would have posted a few selfies with St Mary's in the background but it seems they must have deleted their internet history Seriously now - I don't know the oldest but there are a batch of Wingrave photos from the 1860s. There are lower quality photos but they're not necessarily older. Birmingham may possess some older photos from their early glass plate photographer collections but I've not been able to get much joy from their archivists in finding out what they might have. Thanks Anne. Yes, that panorama is from a similar position. When you look at both the Smyth sketch and the tapestry, it looks like the remaining St Mary's tower was a substantial size, easily visible even though St Mary's was just over the ridge. It would have looked slightly less prominent when the rest of the cathedral was there, because the main body of the church came well up the tower but a fair old size regardless. The tapestry conundrum is the number of spire like objects between the V of WIKAV and a crenelated tower to the right. 5 in total. 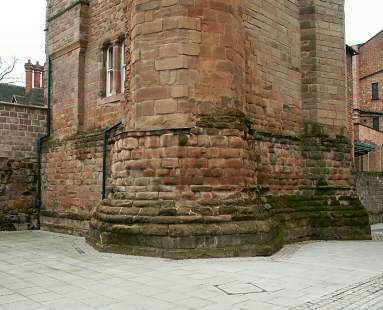 Is the first, small one the Coventry Cross or the west end towers of St Mary's? Is the next tower Holy Trinity but with St Michael's markings? Is the tower with the witchy poo hat the central crossing tower or the west end towers? Is the next tower St Michaels? Is the final tower the central crossing tower of St Mary's or did St Mary's have a tower on its apse? Thought provoking. I wonder if I might put forward a few suggestions about those early engravings of the Priory. I did once approach George D of the council with my idea and it didn't go so well! Overall it was a "NO" and a very pitying look. However, I was quite interested in post 12. I hadn't seen this image before. The church buildings are missing, it's clearly from the north - the Bastille gate in the middle, Bablake would be far right, the Priory and Bablake have been shifted an equal amount to the left. The interesting thing is the height of the Priory in the picture. Now if you examine Hollier's engraving, it's very accurate (in my opinion) - the south shows the fortlet or Caesars tower and the north the Cross where it would stand. Now if you look at the side of St Michael's there is a door half way along in the engraving (unfortuately I only have this cr*p copy), there is also something that resembles a door, but it's nothing like the door in St Michael's. If you enlarge the image it appears more like a tower and would have been obscuring the side door. It rises above the building of St Michael's and is almost the same height as post 12. It was known that the central tower was kept after the Priory was dismantled - this engraving by Hollier is 100 years on but it could still be and would definitely be on the engraving (ignore the captions, only the cross would be correct). You're in good company Moriarty. Coventry is very confusing and all the experts have conflicting theories. There are many images of Coventry with deceptive clues. Some are just obscure, others are made up. Two of my favourite images turned out to be pure fiction. St Michael's did have a prominent north door and many steps up to it, giving it the impression it was window height. Apart from the Spon Street gate and Greyfriars gate, I don't think any of the other gates had round or square side towers by Hollar's day. He doesn't show them on the map and they weren't in evidence in later images/maps. Apart from New Gate on the London road, I'm not sure that they ever did have the kind of gate you'd expect from a castle. The wall wasn't tall enough or strong enough to repel a serious attack. The Bastille gate wasn't that prominent. In later images it grew taller due to additional building and a roof. Looking from the north it was framed by the mill on the left and the mill pond/river on the right. So why does Hollar show towers at the Cook Street gate? The best explanation I can come up with is based on modelling. When you get the churches in roughly the right position, the Cook Street gate is in direct line with the corner tower of the wall where it turns sharply towards Bishop Gate. It looks like a gate with a tower but the gate and the tower are actually about 30m apart. There may have been another round tower where the wall turns towards the Swanswell gate but none of the maps show one. I think that Hollar misinterpreted his sketch and added a tower to a gate that had none because one tower would have looked wrong. Thanks Helen. I know you are modelling the gates at the moment. I'm not really up to speed on gates For what it's worth I would guess to the right is Hales St, to the left bastille? But what I would like you or anyone really to comment on is the following. I've had another look at this and I'm not totally convinced that it is the north door of St Michael's. I still think it could be the central tower of the Priory (pause a moment for the laughter to die down). I've reviewed Hollar's engraving and find the "door" isn't actually over the position of the north door. I thought the bays to the right and left were on the north wall of St Michael's - it appears now that the right side is actually the west elevation of St Michael's. So the 3rd bay from the left is the north door position. This brings the "door" up to the corner of St Michael's, this would align it with the central crossing of the Priory (so it couldn't be St Michael's north door). If you consider that the main body of the church was completely pulled down you would then not have a complete tower, the west side would have a massive hole in it. Look what happens when you magnify Hollar's engraving. You can see the west side of the tower ("door") is missing, you can only see timber support beams. Further, the window in the tower is gothic with a point, yet St Michael's has round windows! But this matches beautifully with the gothic style witches' hats on the west towers. As regards your gates Helen, I would think Hollar's engraving would have to be taken as a base point depending on the answer to the above. There's nothing wrong with your reasoning but there is slightly more evidence that the feature is St Michael's door. St Mary's tower was in that line and the door isn't in exactly the right position but Hollar was a long way out from the city wall. It's not a draughtsman's quality reproduction of the scene. The door on the north side of St Michaels did have a gothic point, which was probably emphasised by the decoration at the time. The styling on that porch and the window above it have changed a number of times and at one time there was a single gothic window, so it might be that depicted in the panorama. The door itself was quite deeply set with a pronounced frame, lending to the impression there was no door and I suppose at times the doors might even be open inwards leaving a void. The west side of the porch had a stair well and funny little pulpit. Porch + pulpit (doorway blocked up) Porch before it was covered up by a shop in the 1960s. Bits of St Mary's survived into the 1600s but by Hollar's day it looks like everything but the west end towers were rubble or buried. The land was leased and if the base of the central tower was still there, I'd have thought the lease details would have mentioned it. Speed's map shows rubble but no obvious tower. For the remains to have still had crenellations it would have been a substantial height (to get above the roof of the nave) and would probably have been taller than the feature on Hollar's drawing. Hales Street would have started to the right of St Michaels and finished in line with the Cook Street gate (but Hales Street not built at that point). The Bastille gate was off to the left but possibly hidden by the wall that kicked out round Pool Meadow. The tower you can see on the left is probably the tower they recently dug near to in that car park near the ring road. Post 17 Helen F. Here's a nice view of the remains of the west end of St Mary's though the towers of course can be viewed in New Buildings, below. Lovely, Prof. It's been said many times 'but if only those walls could talk'. As Coventry was changed so much from the air. Then - never has so much been told to so many, by so few. Thanks Prof, every image helps and those are nice ones. I think the modern word for sextry is possibly sacristy, which is where the sacred vessels, copes and robes would have been kept. That is in use in larger C of E churches today. On 14th Jan 2018 2:02pm, Helen F said: I keep hoping the monks would have posted a few selfies with St Mary's in the background but it seems they must have deleted their internet history Seriously now - I don't know the oldest but there are a batch of Wingrave photos from the 1860s. There are lower quality photos but they're not necessarily older. Birmingham may possess some older photos from their early glass plate photographer collections but I've not been able to get much joy from their archivists in finding out what they might have. To me, the Priory would have been built on a hilltop in the beautiful Warwickshire ancient woodlands, littered with wild bluebells and wild garlic, the natural bubbling springs. Thorns would be planted 'hake' (ancient hedgerow) surrounding. Here the Sherbourne river laying at the foot of the hill, possibly with a hollow tree to form some sort of bung to control the flow to open it either a broad moat or lake that may have given some protection as well as a supply of fish, carp being rich in protein. It may also have had a gatehouse inside giving lodging to travellers, with a stone livery cupboard. It would possibly have had a drawbridge over the moat near the gatehouse, which we know by history existed to secure the inhabitants. The peaceful existence of the brethren was often broken by disputes over game rights over the woods and land. Between the tenth and the twelfth century the Normans changed the landscape. They built new abbeys and monasteries to impose their power. Two linked to the crusaders, and Knights Templars = Knights of Jerusalem. Gardens were full of healing herbs and large orchards would run down to the river. The other side the river fields would be cleared - hay for the animals, mint and rushes would be grown for strewing on the floor of the abbey, rye and oats. The gardens full of vegetables - beans, onions and leeks to go in the stewing pot to make broth. Tansy and yarrow to make a mild beer, honey for sweetening, and pounds of wax for candles, a shed for tools, the gardener being a curtilage-keeper. Around 1200 time the Crusaders brought back wobbly wheelbarrows with the wheels in the centre or the knowledge from Palestine. I believe they also brought back a herbal fern. (All this I learnt on my travels and staying in monasteries). My mum kept a scrap book and cut out any articles about people she knew. I have found this picture of Stan Beasley and the model he made of his interpretation of the Priory out of matchsticks. The article says that his other model of the city centre in 1610 is in the Herbert (it is listed on their site). I also found another article in a 1965 Telegraph that said he was doing a then and now film comparing old pictures and ones he was taking at the time. (he was looking for a picture of Smithford Street) I wonder if he ever finished the film and what happened to it.